The Gary Lee Woodward family moved alot. We lived in at least 12 different homes in 10 years. 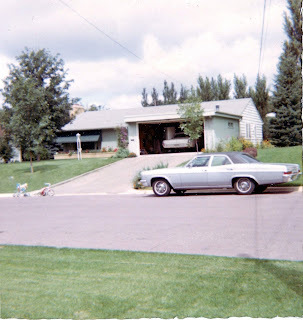 Pictured is our home in Mankato, Minnesota in 1969. Janis, Joan and David lived here but Danny wasn't born yet. To the right of the house there was a giant ravine that snaked down to the Minnesota River - though I was only 5-6 years old I loved to look down the ravine and play at it's edge. Glad Mom and Dad didn't know that or I would have been in trouble. But it was thrilling to see the cliffs and the drop offs be so impossibly far below me. My first grade teacher was Miss Freeze - she wore a dark chocolate, beehive hairdo and horn rimmed glasses and was very, very young. She wore sleeveless shift dresses that were slightly above her knees and I used to think she looked a bit too nerdy for her age and she should loosen up her "hair do" like Karen Valentine on the T.V. Show Room 222. She would have looked a bit hipper with cool hippie clothes and short hair instead of looking 50 years old in her 20's. She's probably in her 60's now - I hope she has ditched the horn-rimmed glasses. I guess I never lacked for opinions even at age 5-6. I don't know where my niece, Greta gets her sassiness - ha LOL. This is the house where I saw Apollo 11 land on the moon. I sat on Dad's lap and he said, "Joanie, always remember that you got to see the first astronauts land on the moon - let's watch this together. This is a historic moment for mankind and even though you are little, you'll always remember watching this on T.V. with your old Mom and Dad." And I do. I remember us glued to the T.V. for a long, long time (got a bit boring for a 6 year old) until Neil Armstrong started to climb down the ladder onto the surface of the Moon. Dad called us all over "This is it! He's going to walk on the Moon!" July 16th, 1969 - we watched it. Also please note - my nephew Grayson's birthday is July 16th - how cool is it to have your birthday be the anniverary of the first men on the Moon! Buzz Aldrin described the surface dust as "fine and almost like a powder" and Armstrong started to climb down off Eagle's footpad soooo slowly - eventually onto the moon and into history as the first human to set foot on another world. He famously describing it as "one small step for man, one giant leap for mankind." He said that moving in the Moon's gravity, one-sixth of Earth's, was "even perhaps easier than the simulations... It's absolutely no trouble to walk around". There were tears in Dad's eyes. I then toddled off to go play barbies or get ready for bed - only mildly impressed. Dan, Elise, Finn and Lily (and Emma, the poodle) are headed back to California from Utah. Daniel's already enrolled in the final semester of is Masters Degree - awesome! Now, there is plenty of precedent in the Woodward family history for moving. WOW - That's 12 Moves! Hope Daniel and Elise's move goes beautifully - they have long way to go to catch up to the prior generation of Woodwards. By our 5th or 6th move Mom had it down to a science she kept all the boxes/labeled and even saved the wrapping paper inside. She was awesome, within 3 days of moving she had all the furniture in place, all the clothes put away and all the pictures hung. When we finally moved to Spring Valley, our new neighbors were amazed that the house looked like we lived there for a year after only 3 days. Mom said she did that to minimize the amount of "change" the kids had to experience in a move. She always had us sleeping in our own beds on day one of the move - thanks Mom! Take Care - more later!